When the paperback of One Hungry Baby was published, I was asked to do a new version of ‘Twinkle Twinkle Little Star’ for inside the back cover. 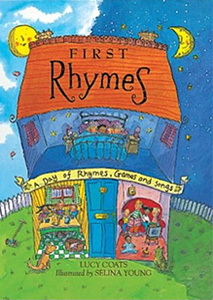 I enjoyed writing it so much that I decided to rewrite all my favourite nursery rhymes for a new audience, plus a few new ones of my own, and some rhyming stories (like Jack and the Beanstalk, the Three Little Pigs and Young Prince Cole) for bedtime. This book is the result, and it goes from early in the morning to late at night, with all the activities children love in between. Ever since I read Wendy Cope’s subversive and anarchic takes on nursery rhymes and childrens’ poems in Serious Concerns and Making Cocoa for Kingsley Amis, I wanted to rewrite the things my mother had sung to me as a child for a modern generation. Wendy’s poems ‘A Green Song to sing at the bottle bank’ and ‘Publishers’ make me laugh still, 15 years after first reading them. I wrote a poem for her when I was writing the book, which I am making public here for the first time. I was much too shy to send it to her back then. Trying keeps me up all night. Apart from anything else, this was also a great exercise in how to write poetry. It’s huge fun to find an existing poem with a good rhythmic structure, take it to pieces and put it back together again. Try it sometime! Here are three of my favourite rhymes from the book. Remember the originals? Tuesday’s Child has an eggy face. Thursday’s Child can eat the most. Saturday’s Child throws beans at his mummy. Has sunlight for breakfast, with buttered sea-spray. This little piggy sulked at home. This little piggy ate crumbs. And who do you think got wet? The teddy bear’s tummy, So Hoppity Out You GET! Sadly out-of-print, but can still be found in secondhand bookstores, or online at AbeBooks.